Christmas is almost here, and now is the perfect time to add some holiday decor to your home. You know that winter is coming, when everything outside is grey and faded away, leaves have fallen, the weather is colder every day. However, you also know that when winter comes, happiness and cheer comes with it. A time well spend with family and friends. Christmas gathering brings joy to everyone. So, all details provide some more magic to Christmas. 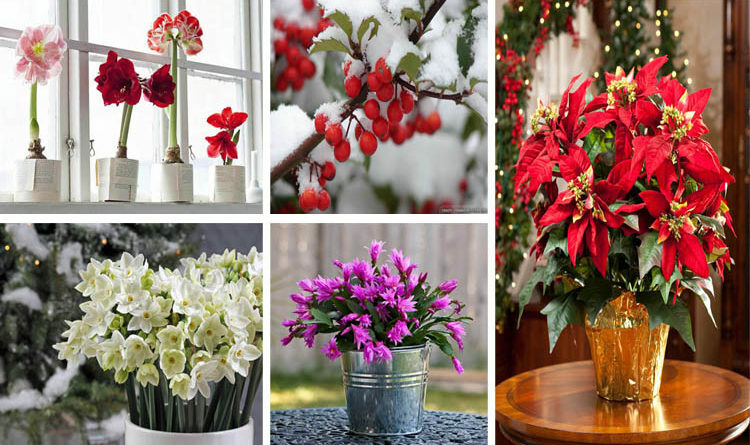 We show you some of the most amazing plants that can revive your Christmas spirit. This one is a red flower, bu its colors can vary from pink to soft yellow. These plants are tropical and are forced to bloom during the holiday season. You need to take some extra care for them in order for the plants to re-bloom. They need direct sunlight and temperature with a lot of humidity, for instance, between 65 and 75 degrees Fahrenheit. This tropical plant can be found in the rain-forests in Brazil.Through out the year, the stems of the plant are green, yet when holidays come, they form colorful red, orange, purple, pink, and white blooms . They need moist soil and mostly shaded places. This plant needs 12 hours of darkness every night 6 to 8 weeks before Christmas in order to bloom during the holiday season. As a relative to the daffodil, this plant originates from the Mediterranean. It creates bell-shaped blooms that are so fragrant, your whole house will smell perfectly. This is the most common plant you can see in people’s homes during Christmas time. It has bell-shaped blooms with shades of red that create a warm welcome to your home. This plant has small white flowers in summer, mostly known as berries that you can spot near Christmas holiday season. Holly has been part of the holiday season nearly 150 years ago. Holly and berries are favorite plants that can brighten winter and bring some positive energy in your warm homes. This one will make you feel more festive. Its origins are from Europe and Mediterranean area. Its blooms have shades of red that often matches the rest of you holiday decor at home.